Sara is a a retired child welfare social worker and long time bleeding-heart liberal. She loves Science Fiction and is a major fan of Lost and Fringe, and now, The Americans. Sara enjoys participating in NCSU’s Life Long Learning Program, taking classes most terms. She loves Pilates, gardening, and hanging out with friends and family. And more than anything, she loves spending time with Chip at their place at the beach or traveling to France. She and Chip have 2 dogs, Mulder (yes, from the X-Files) and Olivia (named for the character on Fringe). They also have a 20 year old cat named Duncan. Sara’s daughter, Brittany, is the sunshine in her life. And Chip is her special partner and love. And now, Chip is her co-podcaster. Chip is a life-long science fiction/fantasy/comics geek who also loves great comedy and drama. And art and music. And books. And politics. Really, he likes lots of things. Plus, he sells beer (which he also loves) when he isn’t podcasting. He is passionate about sharing great art with others. When he found the online community based on the TV show Lost, he was hooked. Lost led to Fringe, and Fringe led to great friendships and podcasting. He is the co-founder and one of the hosts of Tales From the Cask, a weekly podcast about craft beer. 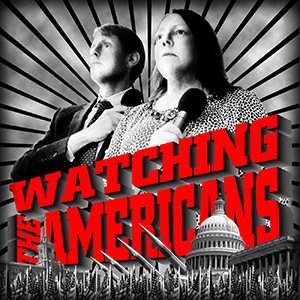 Watching The Americans is a labor of love with his wife Sara that they hope will create a new community of passionate fans of the incredible FX series The Americans.